A NOVEL OF ARUBA INSPIRED BY ACTUAL EVENTS /// AUGUST 2011. TWO PEOPLE WENT SNORKELING. ONLY ONE CAME BACK. /// On a romantic getaway to Aruba, Kathy Barrow and Glenn Hogan discover things are not what they seem. When one goes missing and the other is arrested on suspicion of murder, a media frenzy erupts as San Nicolaas Police Chief Jules Calenda puts the pieces together. Romy Tromp, an ambitious teenage reporter working in the shadow of his big-network idol, learns that perception is not reality when events lead him into a twisted plot of blind justice and unintended revenge. In this riveting story of betrayal, the truth may be more difficult to find than someone lost at sea. 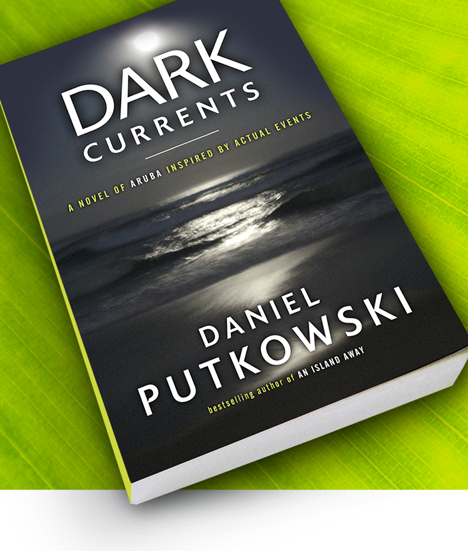 Cover of my novel, Dark Currents. Another great Aruba book that put me on the island as I read. Wow, what a twist. Will there be a follow up to see what is going on with Luz and Herndon? Thanks Dan. Looking forward to your return and posts from Aruba. Hope all is well in PA. Pasa bon ano.